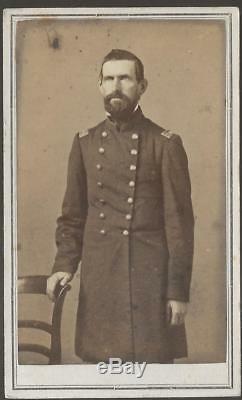 CDV of Lt Colonel Haviland Gifford, 93rd New York Infantry, served 1/22/62-6/29/65 rising from 1st Lt to Lt Colonel. Alternative view in the civil war database. Washington County Regiment; Morgan Rifles; Northern Sharpshooters; New York Riflemen. Mustered in: October 1861 to January 1862. Mustered out: June 29, 1865. The following is taken from New York in the War of the Rebellion, 3rd ed. Crocker, was organized at Albany February 1, 1862, by adding to the companies recruited by him those recruited by Maj. Butler for a battalion of sharpshooters, A, B, C and D, and one company, E, originally recruited for the 76th Infantry. Butler had received authority from the War Department, August 14, 1861, to recruit four battalions of sharpshooters. The regiment was mustered in the United States service for three years between October, 1861, and January, 1862. In June, 1863, some of the three years' men of the 22d Infantry were transferred to this. At the expiration of its term of enlistment the men entitled thereto were discharged and the regiment continued in service, but consolidated in November and December, 1864, into seven companies, A, C, D, E, F, Hand 1. June 2, 1865, the men of the 124th Infantry, not mustered out with their regiment, were transferred to this. The companies were recruited principally: A at Chester; B Hobart's Company, 2d United States Sharpshooters at Albany; C at Minerva; D at North Hamden; E at Cortland Village; F at Fort Edward; G at Cambridge; H at Boston [sic: should be Bolton]; I at Argyle, and K at Troy. The regiment left the State March 7, 1862; served in Palmer's Brigade, Casey's Division, 4th Corps, Army of the Potomac, from March, 1862; Companies B, C, D, E, G and I at the White House, Va. The other companies as Provost Guard, Army of the Potomac, from May 19, 1862; the regiment, as such, from July, 1862; in 2d Brigade, 3d Division, 2d Corps, Army of the Potomac, from March, 1864, and it was honorably discharged and mustered out, under Col. Haviland Gifford, June 29, 1865, near Washington, D. During its service the regiment lost by death, killed in action, 6 officers, 78 enlisted men; of wounds received in action, 1 officer, 43 enlisted men; of disease and other causes, 2 officers, 141 enlisted men; total, 9 officers, 262 enlisted men; aggregate, 271; of whom 1 officer. 22 enlisted men, died in the hands of the enemy. The following is taken from The Union army: a history of military affairs in the loyal states, 1861-65 -- records of the regiments in the Union army -- cyclopedia of battles -- memoirs of commanders and soldiers. Crocker, Samuel McCon-ihe, Haviland Gifford; Lieut. Butler, Haviland Gifford, Jay H.
Cassidy, Samuel Mc-Conihe, Henry P. The 93d, the'"Morgan Rifles, " recruited mainly in Washington county, was mustered into the service of the United States at Albany, from Oct. 14, 1862, with 998 members; camped at Riker's island, New York city; moved to Washington on March 7; was there attached to Palmer's brigade, Casey's division and proceeded to the Peninsula on March 30. It was present at the siege of Yorktown; fought at Lee's mills, Will-iamsburg and in the Seven Days' battles; and upon the return from the Peninsula was present at Antietam and Fredericksburg, but was not actively engaged, having been detailed to perform provost guard duty at headquarters, a post occupied by the regiment for about two years. At the opening of the Wilderness campaign, the regiment, of which a large proportion had reenlisted, was assigned to the 2nd brigade, 3d division, 2nd corps, and showed its fighting mettle at the Wilderness, where it lost 258 killed or wounded out of 433 engaged. 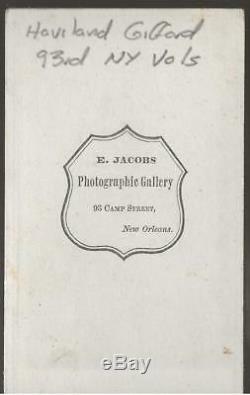 It was constantly in action during the battles of that month; at Cold Harbor in June, and upon the arrival of the army at Petersburg, joined in the first assault, followed by engagements at the Weldon railroad, Deep Bottom, Strawberry Plains, Poplar Spring Church, the Boydton road, Hatcher's run and in the Appomattox campaign. The regiment remained at Petersburg until the end of the siege and constantly displayed such gallantry in action and reliability in the performance of every duty that it well deserved the reputation won as an unusually well-trained, efficient command and as a fighting regiment. It lost during the term of service 128 by death from wounds and 143 by death from other causes. The item "Civil War CDV Lt Colonel Haviland Gifford 93rd New York Vols" is in sale since Sunday, August 12, 2018.